Chiropractor, Dr. Richard Robinson, approached i2i art to have Ian Phillips illustrate a cover for his new book addressing a phenomenon that he'd observed and treated for years. Apparently the vast majority of us have a little wiggle when we walk that actually translates into back problems over time. In his helpful guide he offers suggestions to deal with the wiggle and thus the back. The question that begs asking is, how many of us are willing to let go of our little swagger? Ian ended up wearing both his designer and illustrator hats as he approached this assignment. The striking illustration that emerged from his concept and evocative type treatment work beautifully to communicate what the good doctor had in mind. Don't you just love the illustrative direction this project took Ian in? There's a bit more realism and retro and together it's fabulous! Ian writes in his blog: "This was a fun project, I think I probably drew about fifty pairs of shoes before I got the right look for this! Note the continued stripe pattern in the fabric folds at the knee, the pockets, and repeated on the bottom of the shoe and on her t-shirt. Adds a little playfulness." To see more of Ian Phillip's illustrations visit his portfolio. Some years back, Ian Phillips created a version of these wonderful editorial headers for a small press magazine. They were used in the design of the various sections: Book Review, Letters, Contributors and Editor’s Note. Recently I was chatting with Ian about how much I liked these lovely conceptual images and he enthusiastically offered to revisit them in his fresh new style adding text using his new hand created font. To see more of Ian's updated portfolio please visit here. Ah yes! And there’s always the editor’s note…quite possibly signed in blood! Love Ian's use of a universal symbol--the tin can, to represent ideas and commodities in this fresh (and yet retro) infographic presentation. We'll be bringing you lots more infographics, so stay tuned! To see more of Ian's work visit his updated portfolio here. ...to see more of what he's got cookin' visit here! In celebration of Amsterdam Brewery's 25th anniversary, this Toronto based brewing success story decided to relaunch their (416) wheat beer. Named after the Toronto telephone area-code…this beer honours all things Toronto! Creeshla Hewitt, Creative Director with St. Joseph Content, approached me looking for an illustrator who does maps and she said, "The kicker is that we'd like them to understand toronto...as it is for hip toronto haunts. ", so I shared with her a link to our Pinterest board called 'Maps'. From there she immediately saw the potential in Ian Phillips. I knew she had made a perfect choice in Ian (a master with maps, his love of Toronto and 'inside' knowledge of hip haunts)... just a couple of great reasons. She was also under a lot of pressure to deliver in a very tight time frame and I knew that Ian would never let her down! 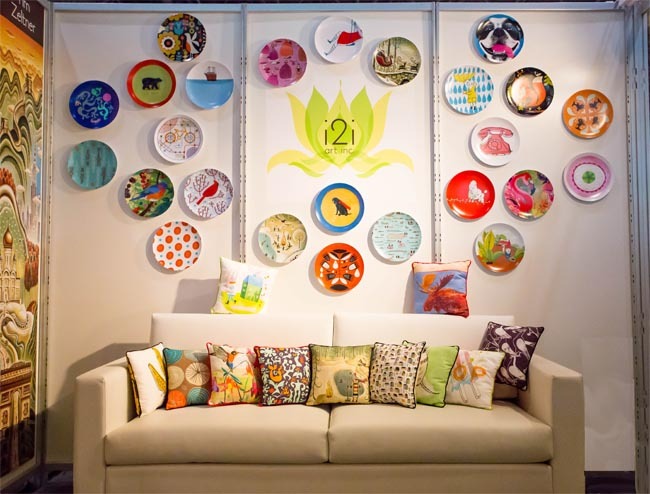 i2i art's first ever exhibition at SURTEX! If you're attending SURTEX next week, we hope you'll come by say hello and meet the artists. You can get a tiny sneak peek here, but when you visit us in person, we'll share our newest collections! If you'd like to arrange to sit down and chat about your needs, we're happy to set aside some time for you. Just call or text Shelley Brown at 416-505-6847, or email shelley@i2iart.com. i2i artists Thom Sevalrud, Ian Phillips and John Webster are 3 of 20 artists and designers commissioned by Shaun Moore of MADE to create custom auction paddles for the Lesbian, Gay, Bi, Trans, Youth Line's upcoming yearly Line Art Auction taking place November 6th at the Neubacher Shor Gallery. 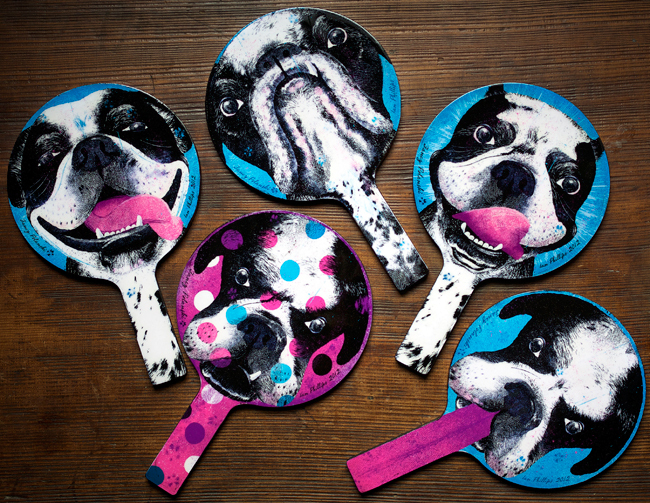 Ian Phillips' paddles inspired by his beloved dog and muse, Fancy Polanski, RIP. 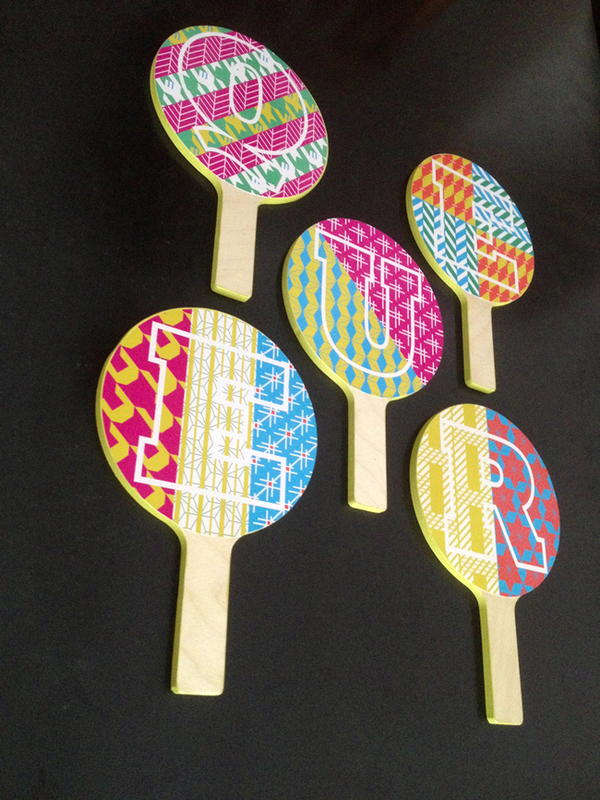 John Webster's paddles, everything Webster wonderful...do I hear bling, bling? Thom Sevalrud says, "The concept for my paddles was influenced by Semaphore signalling flags. I used the Semaphore alphabet to create the word YOUTH. Then I took liberties with the designs by 'complicating' them with flamboyant and crazy patterns that I made myself. The overlaying word QUEER is meant to complete the visual statement to go along with the symbolic representations to form the words QUEER YOUTH. Defiant, colorful and individual!". Who's growing a new stache for MOVEMBER? About a month from now, men from around the globe will be sharpening their shaving tools of choice, to clear way for a fresh Movember canvas. Mo Bros., with the support of their Mo Sistas, work towards a well groomed stache to prompt private and public conversation around the often ignored issue of men’s health, specifically prostate cancer and male mental health initiatives. Looking for some stache ideas? The surface design pattern below, by Ian Phillips was created with fabric and wallpaper in mind, but it may inspire the perfect design for you. All the fun aside Bros., we hope to inspire you to get your pledge machines fired up and grow for the cause. Ian Phillips loves making maps and is a bit of a self-proclaimed foodie so when Viv Magazine called for maps to highlight food "hot spots" in Cape Town, Graz, Hong Kong, Glasgow, and Kansas City, he was all over it. Of the series, these are his two faves. Ian Phillips worked with Art Director, Peter Zaver, to create this cover for Marketing Magazine's Top 2011 Marketers issue. 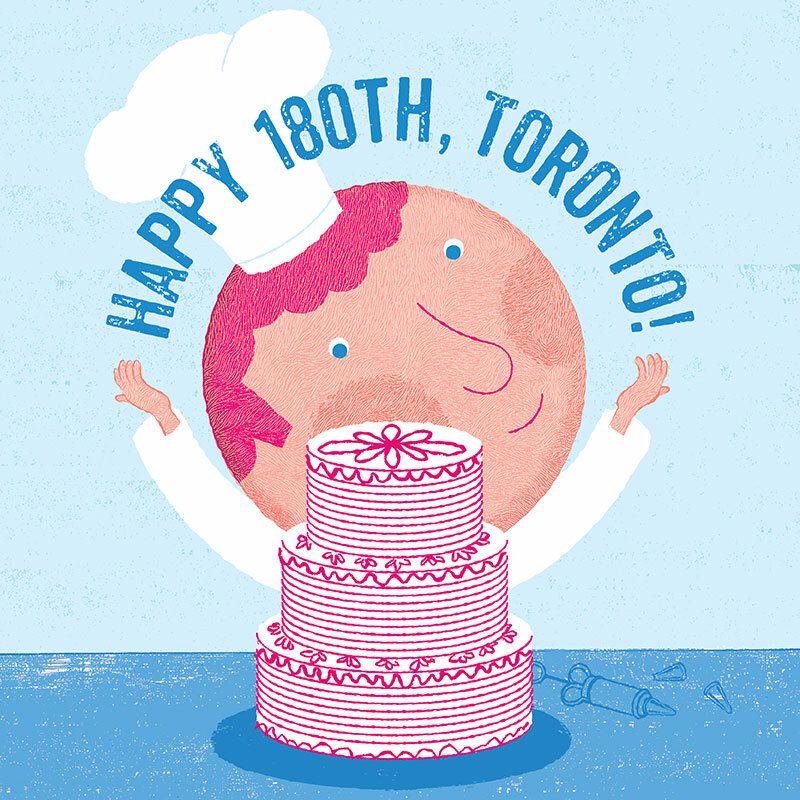 Peter wanted to see a cityscape with the logos of 10 marketers incorporated into the illustration. To Ian's delight, Peter suggested an Andy Warhol style soup can for Campbell's! Take a peek behind the process - below we've posted some of the early sketches. Ian begins with some quick sketches and picks his favourite. He then creates a tight linear to show the client the idea as close to final as possible. The next step after the above tight linear drawing is choosing colors. A PDF of the cover is helpful to make sure there is room for the masthead. These were some of the color comps. Ian loves drawing buildings and people and even managed to create a cameo appearance of his dog "Fancy". Check out the final image to see if you can spot "Fancy". Ian created these illustrations for an article on the Provincial election in Ontario. These three variations were illustrated before the election occurred and based on concerns that Ian (and many Torontonians) has about the current slash and burn philosophy of the municipal government in Toronto. The third illustration is the version used for the article, "Déjà Voodoo Economics", in the October issue of In Toronto magazine. To see more of Ian's fabulous maps and lettering, click here. Recently Ian Phillips was commissioned to bring his humor and whimsy to a very serious story about bone health for the summer issue of Positive Side magazine. The story investigates HIV-related issues with regard to bone density. Bones can be healthy, brittle or too soft… Ian says, "First Goldilocks and The Three Bears came to mind. Then the Three Little Pigs and their houses of straw, sticks and bricks flashed through my mind as a better analogy. The smart-thinking pig built his house with bricks, demonstrating a proactive role in one’s health as the better choice." We're all intrigued with the creative process and what sometimes gets created, but not used, in a project. Ian recently shared an alternate sketch for a recent project he did for Canadian Underwriter. Here are the two different versions he created for the article "Investigating Personal Injury Fraud". The first is the image that did not get used- a more playful take on the issue. Ian has always wanted to illustrate for Utne Reader and now his illustrations grace page 28 of the Nov/Dec 2010 issue! Check out "Secret Liaisons in the Middle East", an author's experiences while traveling and writing about gay life in the Middle East.